Do you mean taskbar shortcuts for programs next to start button? Just to be sure. When you click this shortcut, new instance of PaleMoon is started. If it should be executed in isolation, then this new instance is started in isolation. And then it's up to PaleMoon what to do. If it's configured to execute on the main desktop, it discovers that the first instance is already running and uses window messages to communicate with it, everything goes fine and it continues execution. If it's configured to execute on separate isolated desktop, it discovers that the first instance is already running and tries to communicate with it using window messages, but they're on different desktops, communications fails, and it shows error message "Pale Moon is already running...". So this is PaleMoon behavior. 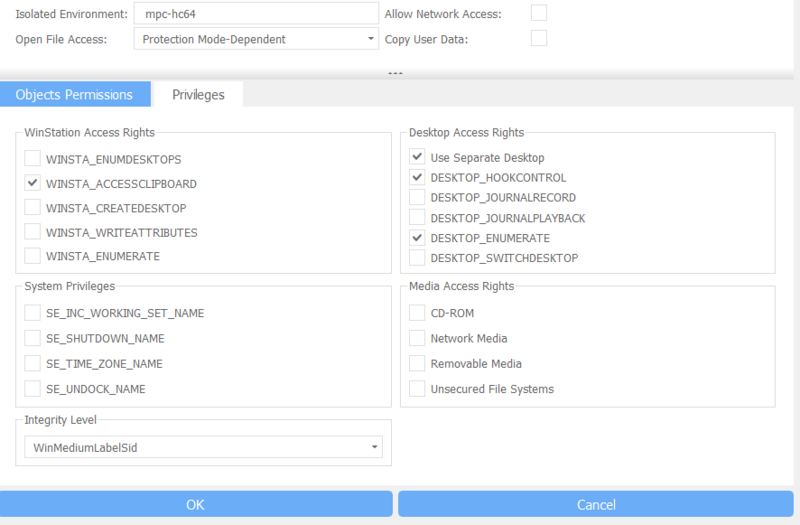 As a workaround you can execute it on the main desktop with HOOK_CONTROL access right disabled. BTW I added PaleMoon to the RulesPack. Thanks for the explanation! Now I get it. Yes, I meant the pinned taskbar icons. I would also like to report that mpc-hc 64-bit has no rule. As far as I can remember, rules pack only has the 32-bit because it would say that mpc-hc is not present, although it is, just 64-bit. I don't know the rules for mpc-hc 32-bit, and so I can't make a wise decision about its settings for 64-bit. That said, I would request that mpc-hc 64-bit be made a rule, and that the rules pack be readily made available to read for re-evaluation by the user afterwards. Not all programs have rules. It's not a matter that your mpc is 64 bit. Devs just didn't had the chance to add rules for the specific program. Just add a rule manual. It should be pretty simple. I know. The problem is I don't have an informed choice about what options to check/uncheck. Maybe checking or unchecking will expose loopholes or problems of usability. So, I want to have a model for this. The rule for mpc-hc 32-bit should have been my model, but I don't know its settings. Give me 10 minutes i will check what works and tell you. EDIT: Program needs hooks to work so you have to enable that and different desktop. Btw i blocked subprograms because on the few minutes i tried it mpc didn't ask to launch anything but if you see any blocks related to subprograms change it to allow. Also had network access off but if you wish put it on so you can update. EDIT: If you use something like madvr or lav filter you might have to put those in the same isolated environment so they properly work and also allow the program to launch them(i have it blocked with my settings). Didn't test because you didn't mention that you used any. I will try your suggested options. But I decided to not put in a sandbox. Maybe it's not designed to be in one. Volume wouldn't work. There was sound, but the volume couldn't be changed. I tinkered with the settings, but it wouldn't work. weird. I can change sound normally when isolated with the settings i gave you. Fwiw, volume is working here. Same architecture, same ReHIPS settings. I mean the master volume, not mpc-hc's volume control. I could change the program's volume through its own volume control, but when it comes to the main/master volume control, I couldn't when inside the isolated desktop.